The Nova Scotia Branch and its members have a common interest in Canadian history, with a strong focus on the United Empire Loyalists, those people who remained loyal to the British during the American Revolution and who came to Canada during and immediately following that war. These refugees represented the largest number of European settlers who came to our land. They caused the split of Nova Scotia into Nova Scotia, New Brunswick and Cape Breton, the latter becoming part of Nova Scotia at a later time. They and their descendants made enormous contributions to the development of the province of Nova Scotia we know today. To learn more see Loyalist History of Nova Scotia . For information about a society that promotes the history and heritage of Black Loyalists see Black Loyalist Heritage Society . A secondary focus of the Nova Scotia Branch is the genealogy of the Loyalists. To help those who are interested in proving their loyalist descent in order to earn a UE Certificate or Loyalist Descent Certificate which many people frame and display proudly, there are several members who have developed genealogical expertise and who are willing to direct and assist those who wish to explore their family histories. For assistance please contact Branch Genealogist, Carol Harding, using the address cmharding@bellaliant.net. In 1983 members prepared a booklet called Our Loyalist Ancestors - Biographical Sketches of Loyalist Ancestors of the Membership . It includes 22 Loyalists: Samuel Andrews, Robert Bayard, John and Letitia Bell, Chambers Blakely, David Bleakney, David Burlock, Colin Campbell, Edward Crawford, Peter Earle, Joseph Embree, Jacob Fenton, James Hatfield, Stephen Humbert, Elisha Jones, Oliver Lyman, Donald MacAlpine, Samuel Perry, Gabriel Purdy, John Rushton, John George Webber, and Edward Winslow. Through a Facebook Page , Branch Meetings around the province, special events, displays at and participation in heritage and genealogical events, the Nova Scotia Branch aims to assist interested people. 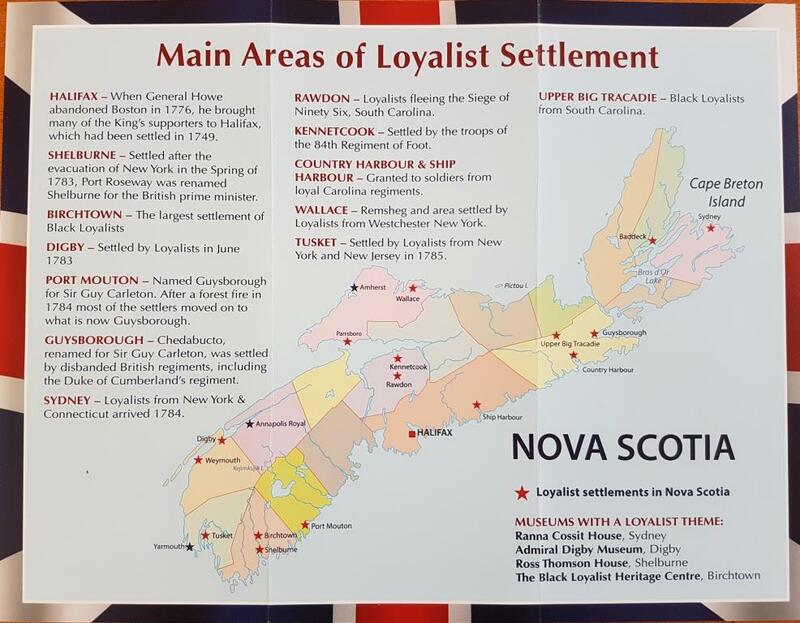 A Branch Brochure with information, photos and a map showing areas of Loyalist settlement is available in PDF format at Nova Scotia Branch Brochure . An informational outline is available in PDF format at The United Empire Loyalists & You and also see Presentation to Genealogical Association of Nova Scotia. Whether you live locally or at some distance, as a number of our members do, whether your family is long-time Canadian or newly arrived, join us and share in our rich Canadian heritage. In the following pages by using the Directory to the left you will find further information. Please contact us with any questions.